Now that winter is behind us, we can actually throw open the windows and put away the coats. Spring has sprung and as we embrace its freshness we might find that our home needs a little refreshing as well. 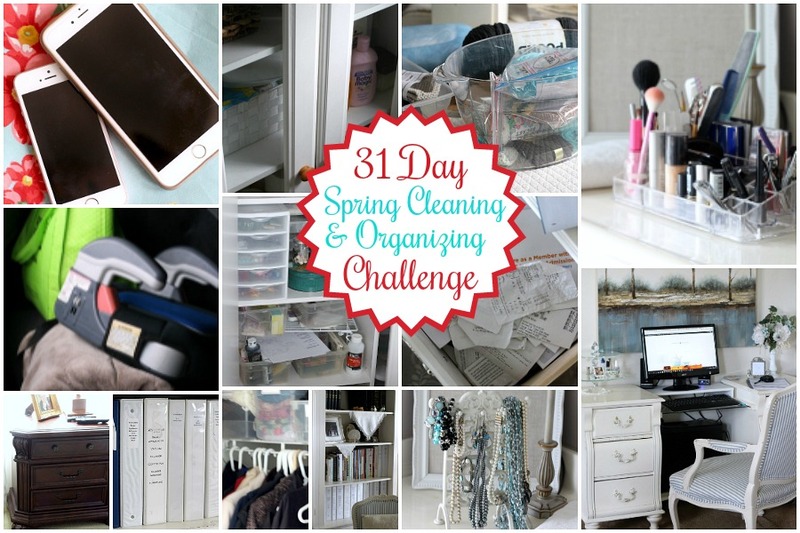 Join me in working through those messy & disorganized areas a little each day with a 31 Day Spring Cleaning and Organization Challenge. Feel great and accomplished with this doable plan. I don’t know how you feel but when my home is out of order, I feel like my life is out of kilter too. Piles and stacks begin growing and finding misplaced items becomes a frequent frustration. So I am about to shake off the cobwebs and dive in to setting things straight again. Want to join me? Instead of looking at the whole mess and wanting to give up before you start, take it in bite-size pieces. One area at a time. One disorganized mess a day. Nothing overwhelming. Tackle one area each day for the month of May and be pleasantly surprised how much you will accomplish. The areas are loosely grouped together but don’t feel constrained to follow the dates if you want to mix things up. 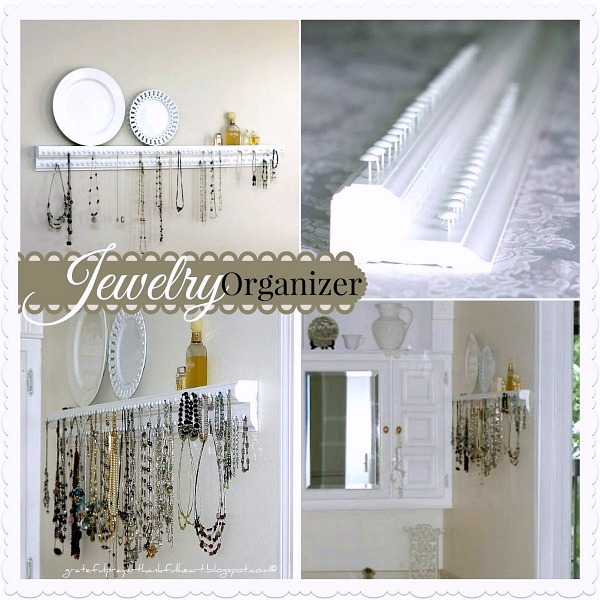 Some areas can be organized and tidied up with a minimal amount of time and effort. Other area will require more time to get it all sorted out. The important thing is to keep going. Be sure to work on something every day. The goal is to keep from getting overwhelmed causing you to lose interest and momentum. Organizing is a process of acquiring skills, applying them, and being committed to being organized every day. If you continue to take little steps every day you will begin to develop habits that makes staying organized easier. Do I have space for this item? Am I willing to donate this item to make room for a new item? Answers to these questions will guide you in knowing whether to keep or dispose of most of your stuff. We all have too much stuff. Some say we use only 20% of what we have. Before you begin organizing, get rid of what you don’t use. Don’t allow an abundance of stuff to grow and become overwhelming. Develop the mindset of purging and regularly let go of things. You will feel lighter and may even begin looking for what you can let go. My favorite place to donate is to the Vietnam Veterans of America, Please Pickup. You can schedule a pickup online and a truck will arrive on your chosen date. They accept clothing, household items, small appliances and small furniture. This old adage used to make my kids roll their eyes but as adults they now understand its value. To stay organized everything needs its own home. Give an item a home and make a point of returning it immediately after use. It usually takes just a moment or two but saves much time and frustration the next time you reach for it. Think more carefully before bringing more stuff into your life. Be intentional and decide if it is something that you really need and will use. Organizing is not just tidying up or putting things in piles. Organized clutter is usually still clutter. 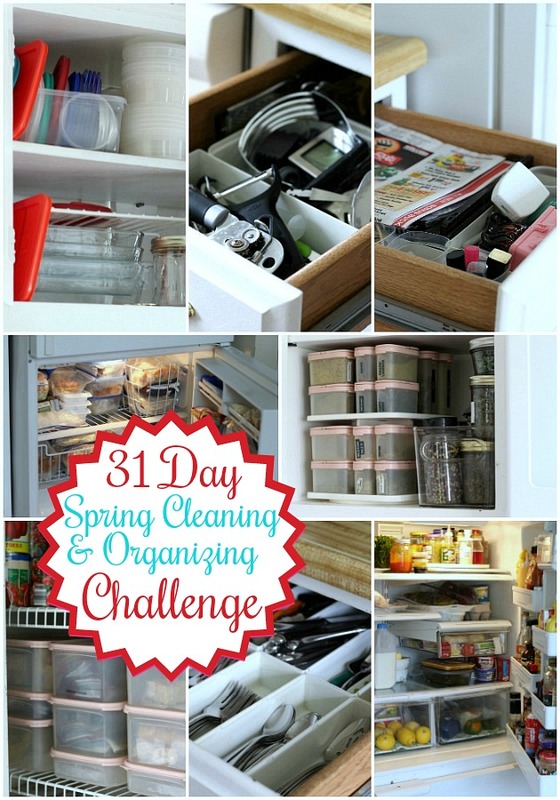 Have you spent time organizing an area only to find it totally messy in just a short time? Do not over fill an area to capacity but rather leave as much open space as possible making all items easily accessible. It establishes a habit that may encourage and lead to stronger skills at sticking with a goal. By making your bed, you are starting to de-clutter your space and a de-cluttered space lowers your level of stress. Clutter is a constant reminder of how scattered and unorganized you are being. A tidy space is very calming. There’s just something about a made bed that feels better at the end of a long day. Partly because when a bed looks good, it also feels good. Don’t let paperwork get the best of you. Handle each piece just once, if possible. That means: Act on it, trash it, or file it. File your paperwork frequently (weekly is best) so it doesn’t accumulate into a mountain that you dread addressing and ultimately ignore. Before you start filing, separate the pile into categories to easily view and assess each category as a whole. 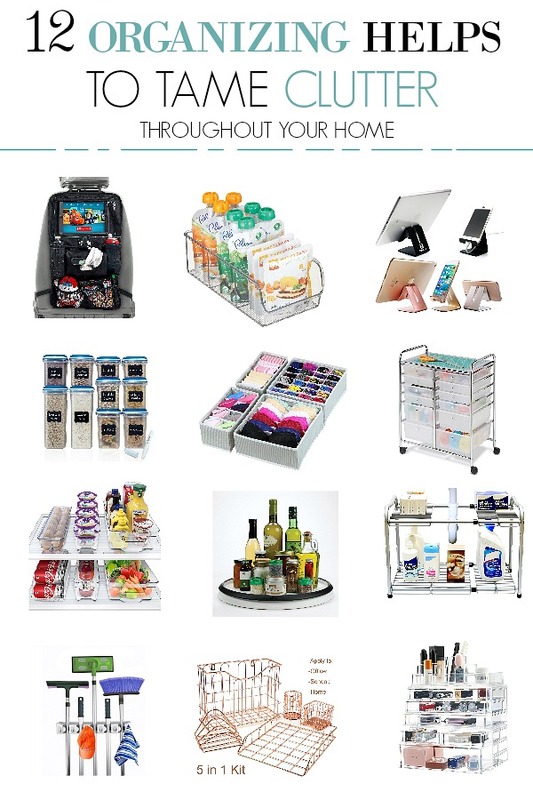 You worked hard to gets all of those areas de-cluttered and given each item a place where it is easy-to-reach without a frustrating, time-wasting search. But you can’t stop there or you or will be right back to battling the piles and messes. Keep the process going! Discipline yourself (and the members of your family) to put things back in their place right away. With a little time, the urge to “do it later” will not be nearly as attractive than the thought of keeping things organized and tidy. It is hard, but if you keep the process going, you can organize your life! Here are some helpful items to tame the clutter throughout your home. The worst place in my house is the office and then the garage. Those are two places I am going to concentrate on in May. Thanks for providing a list to follow. I just love your blog and look forward to your posts. I am in the midst of this. Even if I get through one drawer, it’s a satisfying feeling of accomplishment. I also try to get rid of one thing each day. As to throwing open the windows, there is such a small window (no pun intended) of time to do that here. The pollen pours in through the window, and once that’s cleared its about too hot to open the windows! 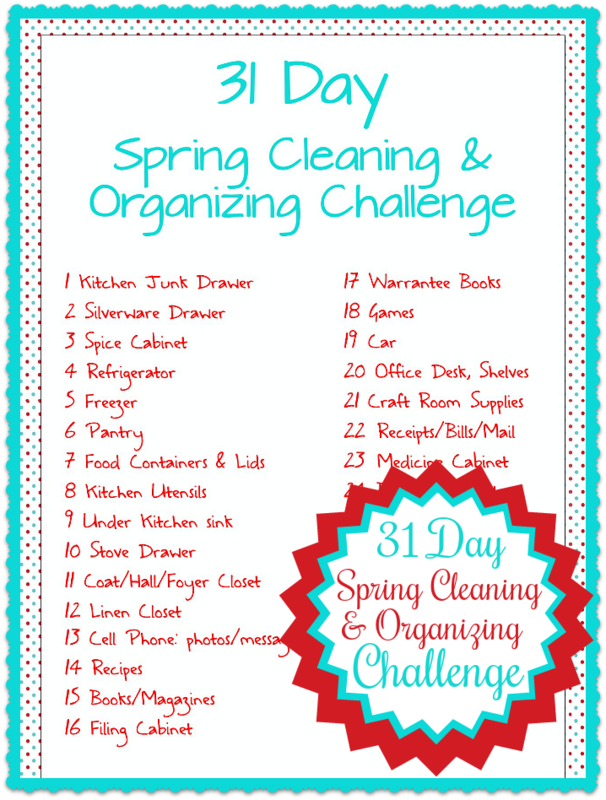 I love this idea, but our May is so busy with end-of-the-school-year and family activities, I think I’ll do this in June! !